The events at Murrieta appear to have been arranged to provoke a confrontation with conservative activists, probably to boost voter registration drives and to motivate potential Latino and leftist voters for the upcoming election. There was an attempt to provoke a much more violent confrontation between the two camps of protesters, which failed. First, the buses trafficking illegal aliens for colonial resettlement in the US are said to have been running for 6-7 months before the incident at Murrieta occurred. However, they ran at night. 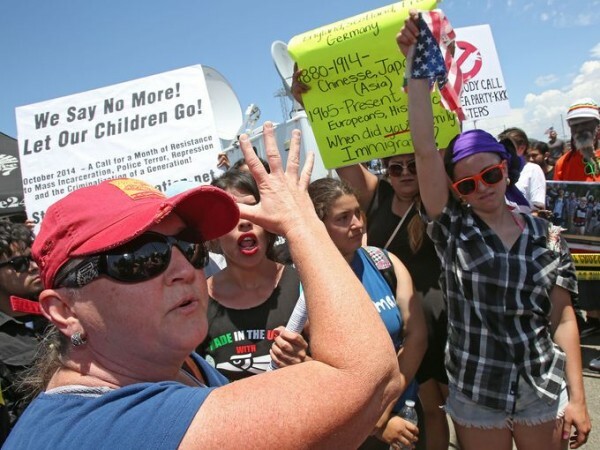 At the time of the Murrieta protests the bus schedule shifted to delivery of the illegals to the Border Patrol station in broad daylight and news of the buses was ‘leaked’ to conservative activists in the area. Not long after the Murrieta protest was provoked the buses transporting illegal aliens completely disappeared again from public consciousness. Did the “Coyote Express” really stop running after only a couple of weeks? It seems seems doubtful. We just do not hear about them any longer, because it is no longer in the interest of the illegal-alien smugglers, including those in our own Government. Murrieta is not very close to the Spanish-language media outlets, but on the day of the protest these outlets had been fully alerted and were on hand in the remote location in great force. Video of the protest was relayed to the Hispanic audience in order to inflame them as much as possible, preparing them for the coming voter registration drives. Anti-illegal-immigration protesters were roundly trashed in the media. 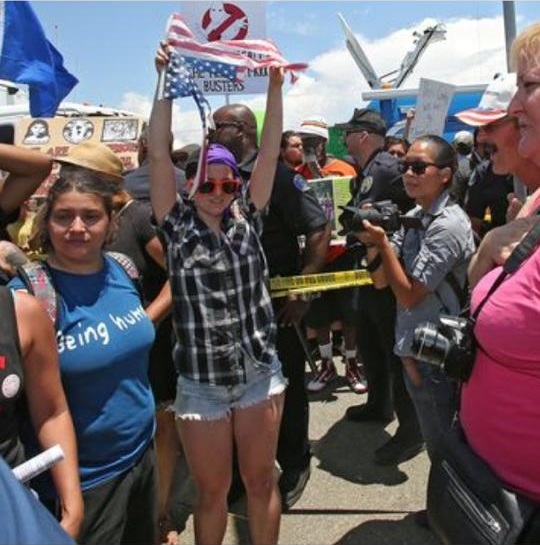 On the day of the second protest at Murrieta (July 4th), the hundreds of protesters at in front of the border patrol station were herded together in a very small space, face-to-face. Angry conservative protesters and illegal-alien-invasion supporters were separated only by a couple of yellow ribbons. It was an ideal environment for a violent riot to break out. There was a tribe of 10-12 young, self-described anarcho-communists, who ripped up an American flag on the conservative side of the dividing line right between the two groups of angry protesters. It seemed that they were doing their best to provoke a violent reaction and a riot between the two groups. When no conflict broke out after some time, the anarcho-communists moved to the South side of the Border Patrol Station, where there was another small group of anti-illegal-alien protesters and started a physical altercation directly by reportedly shoving a female conservative protester to the ground and trying to physically prevent the police from arresting Mathieson. This clip shows the latter parts of the incident between the anarcho-coummunists and the police. Another view of Janet Mathieson ripping apart an America flag on the anti-illegal-alien side of the dividing line between the two groups of angry protesters.